Global patent and trademark service – NAIP Corp.
NAIP Group has a strong patent engineer team. Our engineers are high-performers with a wide range of specialisms, recruited from the best universities and a range of industries. On being recruited they are put through a patent drafting training program of around three years. Department heads review each patent specification, OA analysis and response on completion by patent engineers, in terms of its technical detail and the writing style, to ensure quality. Our engineering team, therefore, has gained an accurate understanding of the technical features of inventions across a range of industrial fields, allowing them to provide our clients more comprehensive patent protection. NAIP Group’s administration team has adopted a dual mechanism to ensure quality and efficiency in our patent workflow. 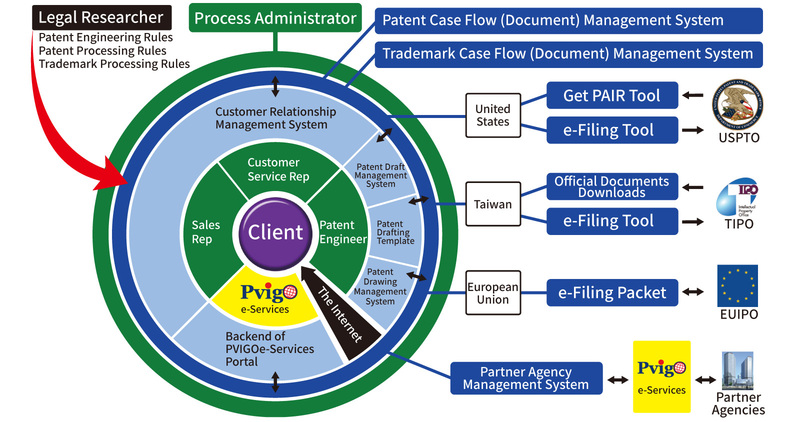 First of all, patent workflow management is double-checked by department heads, to ensure no mistakes occur. The second level of protection involves each of the departments in the workflow chain checking the material handed over to them in terms of accuracy and with regard to any pending deadlines, meaning cases entrusted to us go through several quality checks. Although all cases go through this dual mechanism, with support from our comprehensive automated systems, We still can expedite certain urgent cases on request from clients to meet a desired application date specified by a client. NAIP Group has an in-house legal research team, which is constantly monitoring changes in patent regulations worldwide, in order to provide timely in-house classes and training and to research responsive strategies with the patent management and engineering departments. They also provide notices for clients on these changes, to ensure that clients are aware of the latest regulations, and to ensure that they have adequate time to make adjustments in their internal patent management strategy. NAIP began to develop a series of automated patent management systems in 1999. Our patent services team converts specific client needs and the regulations for patent prosecution and patent drafting in the specific country in question into a structured data file and enters it into our system. On receipt of the data, the system automatically provides our service personnel with information, such as the official deadlines for the case in question, which item of the prosecution process has already passed its deadline, what processes are required for each kind of case and each application stage, which forms must be included with a patent application and the procedure for the following stage of the process. We've developed a patent drafting template which checks patent drafts and makes interactive revisions, as well as ensuring the draft meets the standards of the country of application, lowering the chance that it will have to be amended, and thence cutting down on client costs, as well as accelerating the grant of the patent. NAIP Group's IT team have also developed a system which increases the accuracy and efficiency of patent e-filing in Taiwan and the US, and trademark e-filing in Taiwan. This means clients can get an application number immediately, as well as enjoying a discount on official filing fees. We've developed a mechanism to automatically download data from the US PAIR system. This data is then automatically compared against NAIP Group's database, to ensure that the application filed by NAIP has already been processed by the USPTO. Notifications are given on receipt of an office action or other official correspondence from the USPTO. We've developed the USPTO eOA Viewer tool, which allows us to receive OA-related data immediately, giving us more time to prepare the OA response; and this tool also allows for USPTO citations to be downloaded into our internal image file database where it can be referenced by clients and our patent management team. In order to provide our clients with worldwide patent protection service, NAIP Group only works with global partner agencies with sound operation record, patent engineer team with comprehensive technical fields, meticulous administrative procedure, legal consultation service of patent regulations, and reasonable price. At the same time, We have also established a SOP for working with our global partner agencies, to ensure that both parties can apply the same strict SOP to provid our clients with a full range of quality professional services. Winston Hsu, NAIP Group founder, is a licensed US patent agent; and NAIP Group also has another US patent agent, three Taiwan patent attorneys and a Taiwan patent agent. Each of our patent attorneys and agents is experienced in the field of patents, as well as on-the-ground industry experience in their own field. They excel at drafting specifications and claims for clients, as well as OA analysis and response and identification of infringement. In addition to this they also engage in telephone interviews with examiners on behalf of clients in order to increase the chances of a patent being granted. NAIP has built the PVIGO e-Service Platform, to provide clients with IP cloud services. In order to ensure that our clients can access all the data on their patent securely and conveniently, this platform is protected by several layers of security and uses an access control matrix to ensure that users can only access data relating to their own patents. 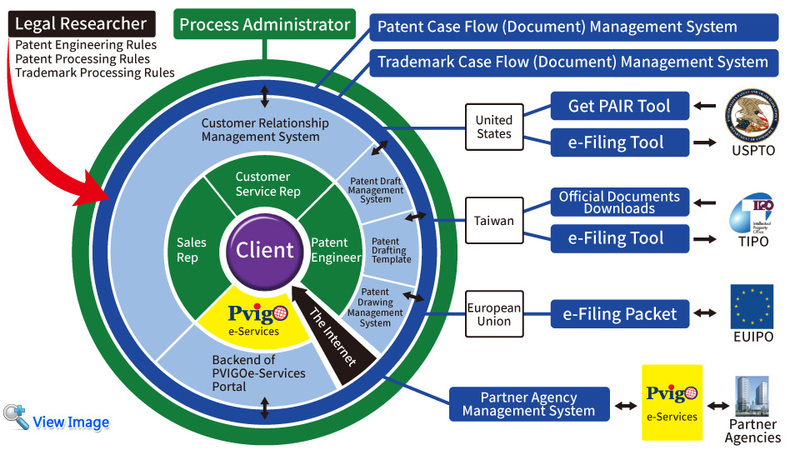 The system also allows users to set customized layout to view patent data, monitor their application progress and billing information, as well as image files of the patent application and of official correspondence from the patent office on the platform. The platform also allows clients to pay renewal fees online, as well as to access the list of official fees for each country and legal information. North America Intellectual Property Corp. (NAIP), with professional patent knowledge and process control expertise accumulated for over 20 years, will provide you with a world-wide renewals payment and management service. Meanwhile, to enhance the effectiveness of patent renewals management, NAIP has developed an E-Manage System providing renewals online entrusting and ordering. NAIP PVIGO team knows exactly what your need. We integrate patent info, status, and image file into “Patent Docket”, for you to look up them at anytime, anyplace. Patent is the accumulation of knowledge. Patent Watch, by means of an insight into this knowledge database, is able to retrieve the information you are interested in. Besides routine looking into the technology progress of other competitors, Patent Watch, through data analysis of market trends, will be able to do a comprehensive R&D planning and then finds the product positioning. Trademarks are indispensable tools for business branding, advertising and marketing. By registering your trademarks, you can obtain exclusive rights and help your clients easily identify the unique symbols, like words or images, that represent your goods and/or services.